Good Morning All! 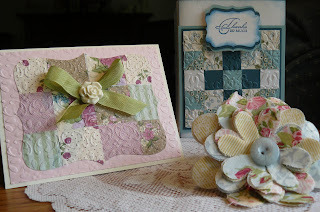 I've put together a card kit using the Strength and Hope stamp set and the retiring Lap of Luxury DSP. I've wanted to do this for a while, but school/dance/basketball/work and other time constraints have really gotten in the way! Well, no more excuses ... here it is! 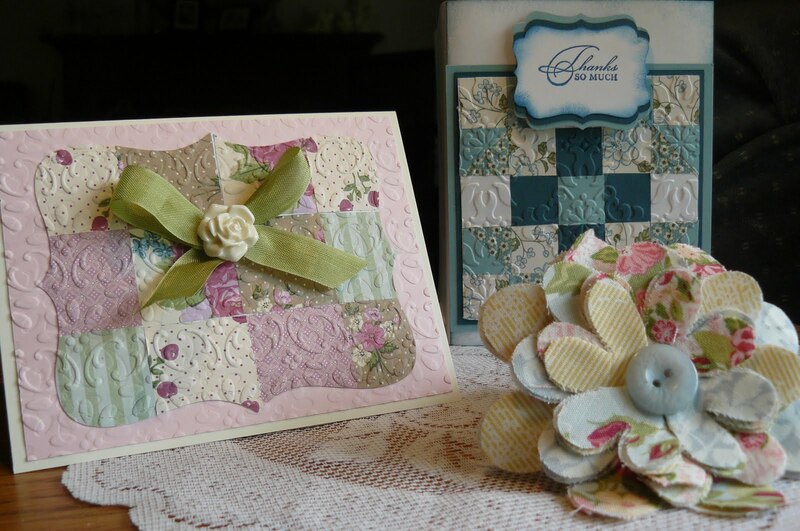 The kit comes with all of the paper pre-cut and scored for you to make your cards, the envelopes, and all necessary embellishments (ribbon, brads, pearls). (I will even emboss the vanilla card using the Framed Tulips embossing folder, and the Perfect Plum strips using the Perfect Polka Dots embossing folder.) 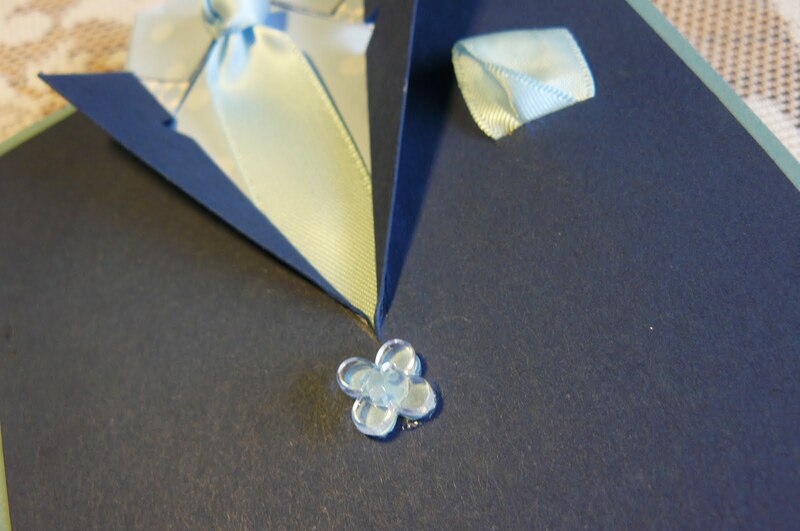 You will need to supply the ink, adhesive, as well as some Dazzling Diamonds Glitter, although glittering your butterflies is an optional step. The Strength and Hope stamp set is not included, but there is the option to purchase from me below. Check out all the promotion details here, including why it's such a great stamp set to purchase! $2 from the sale of every set goes to the Breast Cancer Research Foundation! Woohoo! Cost of the Card Kit is $15 with the supplies listed above. If you need me to ship it to you, I will add an extra $5 to the charge. If you order the stamp set through me, I will discount the card kit 20% (you can order either wood or clear stamps). Cost of the instructions only, emailed to you, is $3.95. How does my Class to Go work? Basically you are making your own set of cards using the supplies I cut out & send you. You'll need a basic supply of ink, possibly a few punches and other common tools along with your own adhesive. You'll have 4 great cards finished and ready to use right away or to copy later. When you order the Strength and Hope stamp set in clear or wood mount you'll receive all of the supplies needed to make the 4 cards shipped to you, and I will deduct 20% from the cost of the kit. Plus you'll receive the photos & step by step directions sent via e-mail. 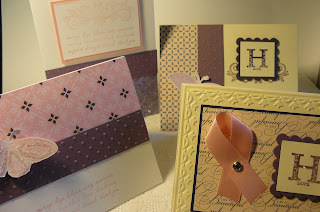 Strength and Hope Card kit with pre-cut and scored cardstock and Designer Series Paper, embossed cardstock, envelopes, and all embellishments except for the glitter. Cost of the instructions only, emailed to you, is $3.95. I will email all instructions with the full color photo when your payment is sent to me. If you'd like to order the Strength and Hope stamp set from me & get the Class to Go cards kit, please contact me at jvn89 at aol dot com by Thursday, June 30th, 9 p.m. EST, & I'll send you a PayPal invoice. (Tax will be added on to the invoice.) Hurry -- 1st come, first served! I finally finished my samples for the Bold Blossom Card Class that I'm hosting tonight! I love the colors IRL, even though the photo doesn't truly do it justice! The colors are Pink Pirouette, Certainly Celery and Baja Breeze. 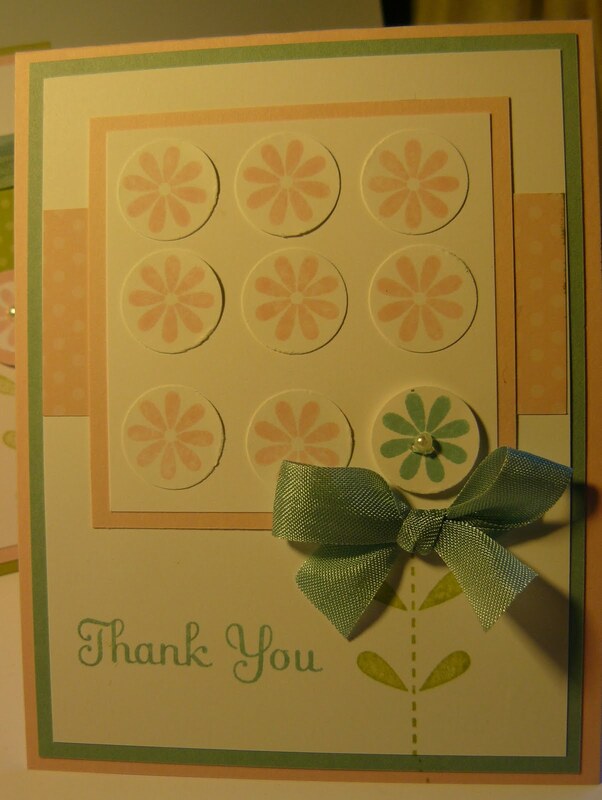 I used the Bold Blossom stamp set with the Swirls and Curls stamp set for sentiments (except for the "thank you" from the Thank You Kindly stamp set). You can see more details (i.e. stamp set order numbers) here. I used the Big Shot to emboss a few of the layers for more interest. A few punched circles, popped up, completed the cards. If you want the tutorial, I need to send you to Chat Wszelaki's blog -- look for her April tutorial. 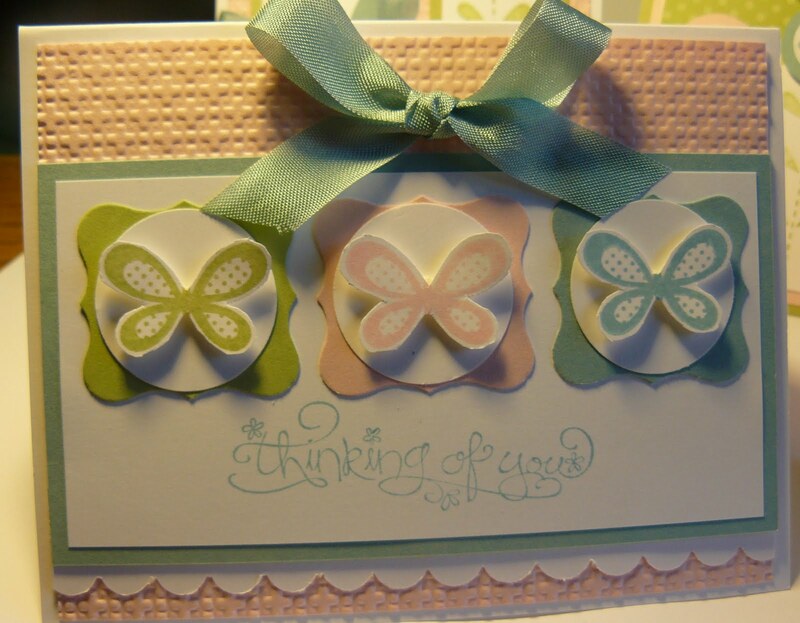 I just changed the colors and the sentiment stamp set, primarily because I'm out of Concord Crush card stock right now, and I don't have the Curly Cute stamp set! 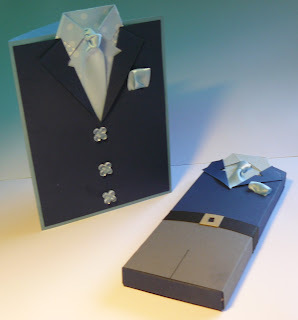 Isn't this the perfect way to demonstrate how you can case a card and make it your own, just by changing the colors/sentiment, ribbon, or a few other details?! You don't need to copy everything -- it's quite possible to go broke if you do! Tomorrow marks the end of another school year for my kids -- at 11 a.m. tomorrow, Chris will be entering the 8th grade and his last year of Middle School, and Lyndsey will officially be a sophomore at the high school! Yikes! The secretary in the high school has been wonderful to Lyndsey this year (they all have been wonderful, to be honest! ), and she is retiring at the end of the school year. I want to share with you my Saturday morning project that I made for her, to let her know we appreciate her kind, caring, thoughtful manner with the kids. No matter how involved this project looks, I did complete it in 4 hours total. Mind you, I had in mind what the cards and tags would look like, but still, for a project of this size, that's something! 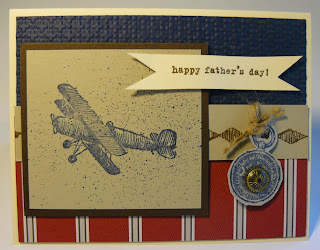 The tutorial can be found on Jackie Topa's blog, Addicted to Stamping, found here. I used the Brights DSP stack for most of this project -- I think the only exception was a small amount of Sunny Garden (also in Daffodil Delight) DSP for the 4 tags which you'll see in another photo. 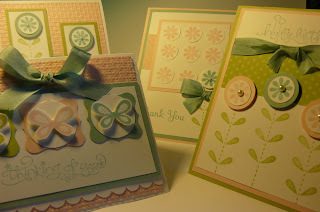 You hopefully recognize the stamp set used as Bold Blossom from the spring mini catalog -- this set is being carried over to the new catalog so you can certainly purchase it on July 1st! It pairs so beautifully with the Bouquet Blossom punch -- my 3 colors that I consistently stuck with is Poppy Parade, Pumpkin Pie, and Daffodil Delight. I "threw in" the occasional Old Olive card stock as well. 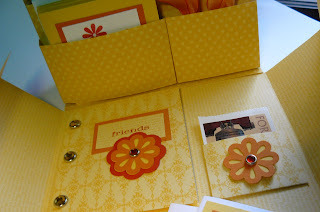 Above, you see a closer photo of the inside of the box -- the tag on the left is from Vintage Vogue -- I used my marker and Poppy Parade to color just the "friend" sentiment from the large "F" image in that stamp set -- I layered it on Pumpkin Pie. 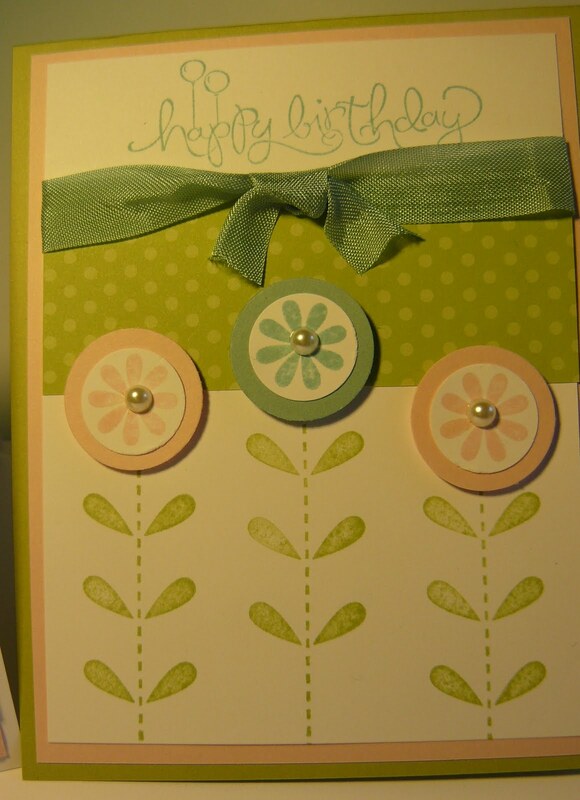 The right pocket in the first photo holds the stamps -- I used Rhinestone brads on both flowers from the Bouquet Punch -- the left flower is all 3 layers of that triple punch -- I used only the smaller 2 layers of the punch for the postage stamp pocket flower. The brads were the Circle Fire Rhinestone brads -- I believe they're being discontinued (and may already be out of stock!). In the bottom photo above, you see the outside of my completed box. 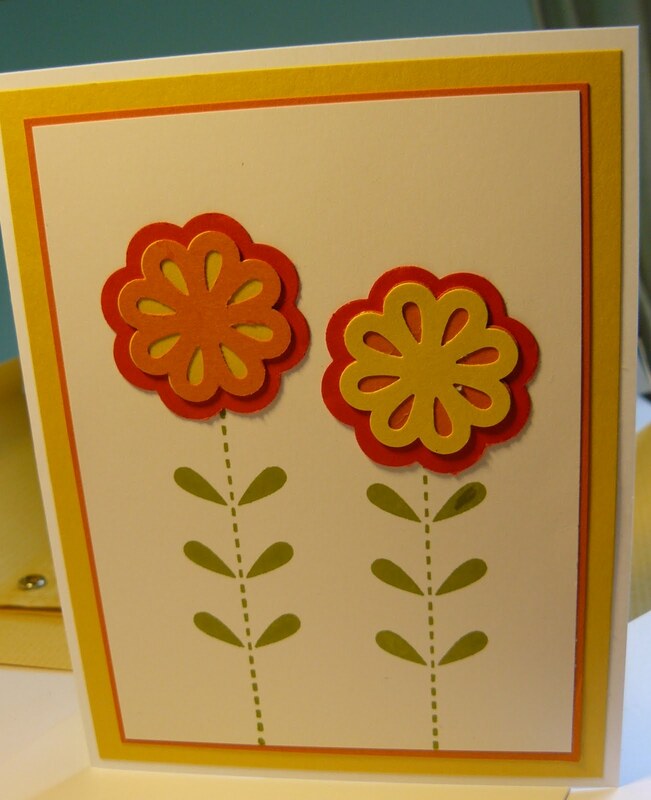 I punched the flowers, stamped the stems from "Bold Blossom" and matted on Old Olive card stock. This box is really neat! You just fold up the bottom and put the lid on to close the box! It stays put! 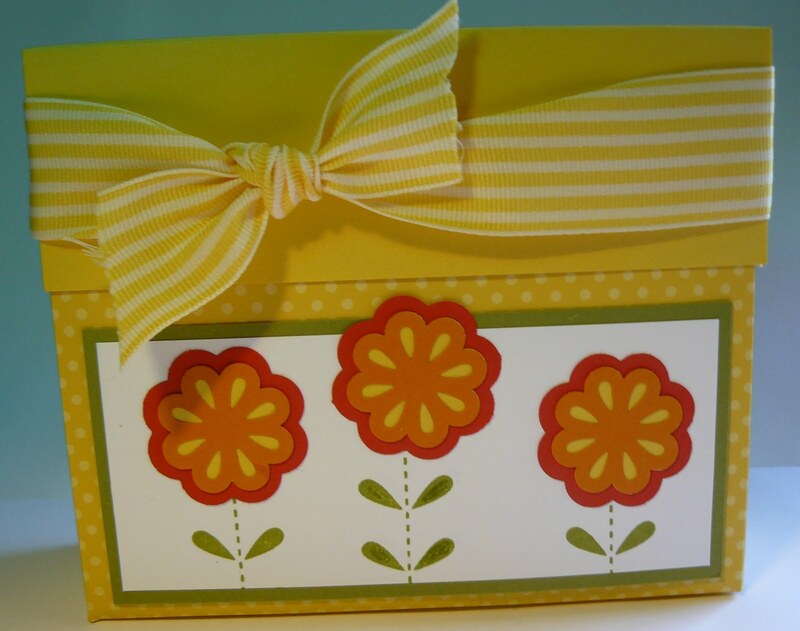 Well, my favorite color of all time right now is the Daffodil Delight, and I finished the lid of my box with the wide 1 1/4" Daffodil Delight striped ribbon. I'm thrilled to say that this ribbon isn't leaving us yet! Too much detail?! I have more pictures for you -- these may speak for themselves! 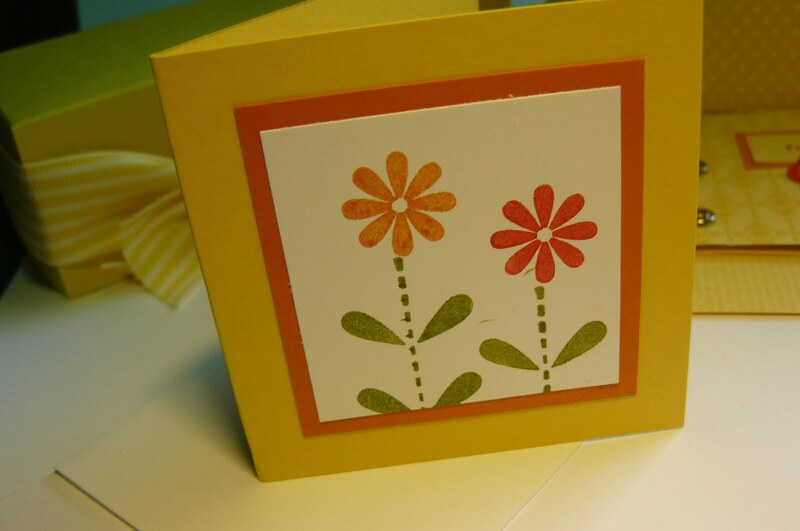 A full-size card that fits in the back pocket of the stationary holder. I included 4 cards and envelopes. 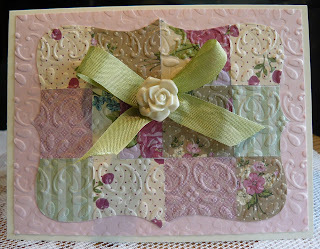 A 3x3 card -- there are 4 cards with envelopes in the left middle pocket of the photo on top. I made 4 tags to complete the ensemble. Sunny Garden DSP coordinates well with the Brights stack. 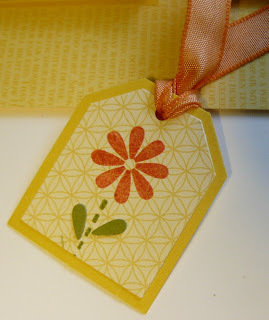 I stamped just a part of the stem from Bold Blossom. The "leaves" are the remainder of the triple Bouquet Blossom punch when I punched out the smallest, most detailed flower in Old Olive -- cute, huh?! Pumpkin Pie 3/8" taffeta finishes the tag off nicely. You can see the tags peeking out of the right middle pocket in the very top photo. That's all for today! I have more gifts to make before tomorrow so I need to get going! Thanks for stopping by! 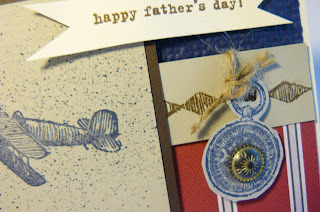 Happy Father's Day to all of your husbands, dads, brothers, sons (and maybe to you?!) as we celebrate a beautiful day honoring all dads! My husband has a passion for flying -- he's a pilot as a hobby, but would give his eye-teeth (maybe even more! LOL) to be a pilot for his career! He started out getting his pilot's license very young -- if he didn't get his pilot's license before his driver's license, it was within a month or two! Since then we've made a few trips to visit family, a jaunt here and there to Nantucket or Martha's Vineyard, up to Maine or New Hampshire for lunch, etc. Unfortunately, flying is very expensive! You rent a plane by the hour (at $200 or more! ), which sometimes prohibits those little jaunts nowadays. Still, I thought he'd appreciate this card to celebrate his day! I used the Color Spritzer tool to add a little pizzazz to the card. Not sure if it had the desired effect or not. I used a vintage brad in the center of my compass. 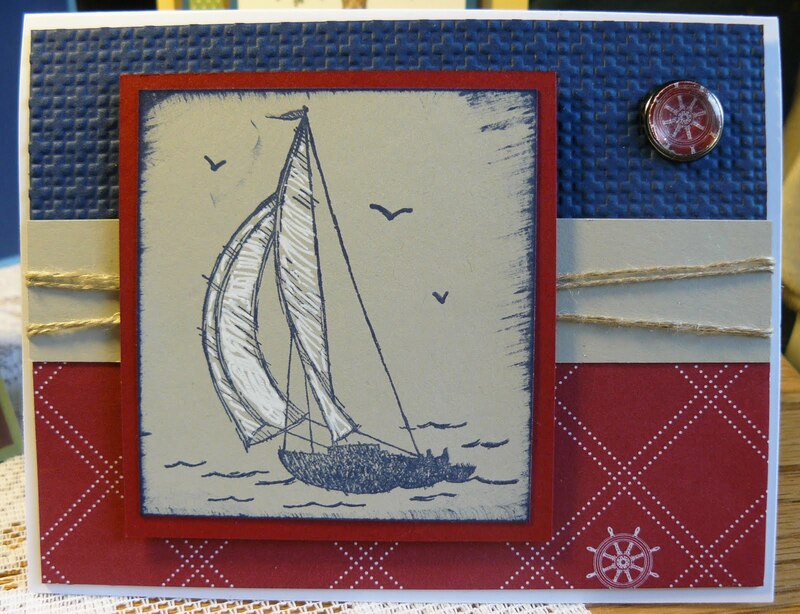 The paper is from the new Nautical Expedition DSP pack in the summer mini. Love the rich colors in this! Here's closeup photo. 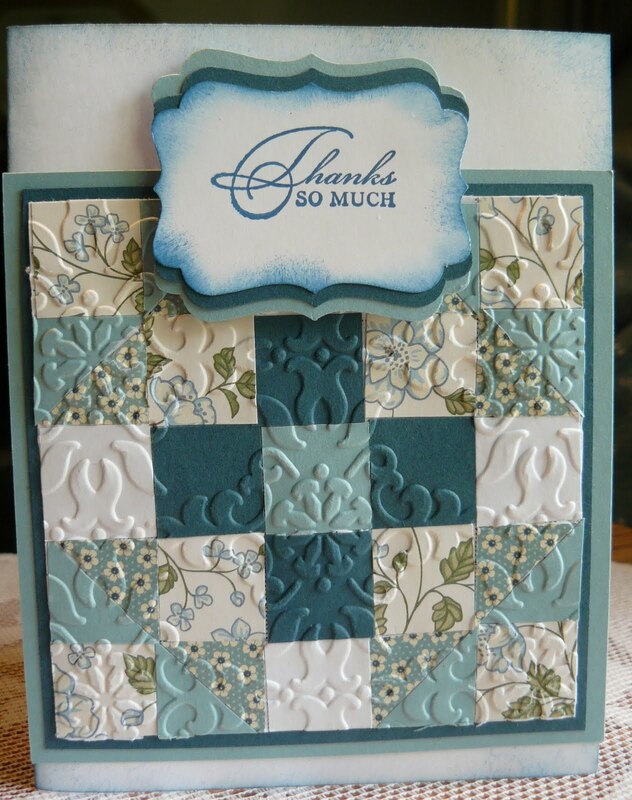 The Night of Navy layer is embossed using the Big Shot and my lattice folder. I handcut out the compass and my "banner". That could have been an idea too I suppose -- to use it as a banner that the plane was towing! Anyways ... I hope your weather is as gorgeous as ours today! After church, we're headed up to a quaint little outdoor restaurant in Rockport for seafood and an afternoon skipping over the large rocks that "dot" the shore! Well, I expounded a little on my shirt card that was part of my "For the Guys in Your Life" card class earlier this week. Check out my cute shirt chocolate holder! The item on the right is my Shirt and Tie Chocolate Holder. Now I can't take complete credit for this holder -- I actually got the original template from Jill Hilliard's blog earlier this week. I changed the template just a bit and then adapted my shirt and tie to fit the template. Want to know how I did it? First of all, go to Jill's blog for the chocolate holder original instructions. She said to cut the paper at 7.5 x 8.5 inches. I found that cutting it at 8" instead of 7.5 actually covered and enclosed the whole bar -- it just worked better for me. Then, I used the same instructions as for the shirt card, but adapted the measurements. 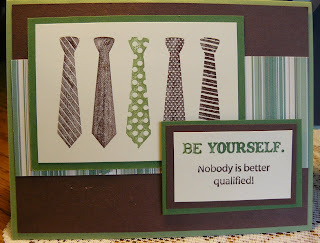 You can get Jackie Topa's tutorial for the shirt card here. 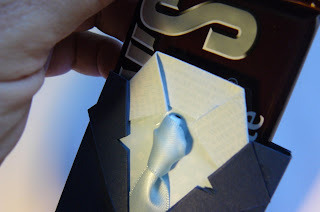 I then cut my shirt at 2.5" rather than the 3.5" that was used for the width of the card. Once again, I scored down 1/2" to make the collar, punched the hole in the center, and folded in the corners to form the collar. I added some pants on the bottom (2.5" x 8" cardstock) because it was way too much shirt! A 1/4 inch "belt", with a 1/2 x 1/2" square for the buckle finishes the ensemble. What do you think? 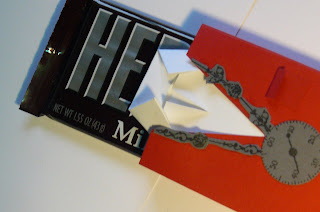 Tucked safely inside is a large Hershey's chocolate bar (part of the 6-pack) -- yum! I have one more to show you, but this time I tried to "casual-ize" it (is there such a word?!). It's for the gym teacher, and my husband thinks it doesn't work! I ended up having to take a piece of white cardstock and fold it in half so there was a button-down look, instead of the tie. I stuck a "stopwatch" around his neck -- do you recognize it? It's a stretch, but I used one of the small "watch" images from the Sense of Time stamp set (retiring the end of the month -- might want to hurry for this one! ), and then pieced together the minute and second hands from the larger image to make the "chain". I wanted him in shorts, but you can't really tell shorts from pants, ... so just imagine, okay?! LOL! So ... I really enjoyed creating these, but I'm a little stumped how to make it look more "feminine". I have 2 days to figure it out! The kids finish school on Tuesday! Thanks for stopping by! Let me know if I didn't answer your questions! 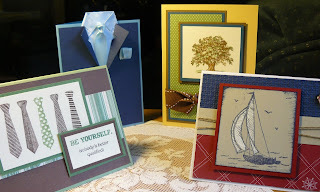 "For the Men in your Life" Card Class tonight! Tonight is my last-minute addition to my card class schedule: "For the Men in your Life" is the name of the class and it features all kinds of cards that would be appropriate to present to the men in your life (hence the name! LOL!). I wanted to get this in before Father's Day, but not everyone has a father, but usually has someone they need a card for: a close friend, a neighbor, a son, a brother, a husband, etc. Two of the cards pictured above feature stamps or stamp sets from the current new Summer Mini Catalog. 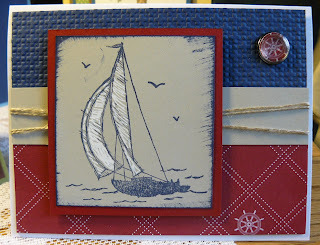 I love the "Sail Away" stamp that I used for the Cherry Cobbler/Night of Navy/Sahara Sand card on the right (also pictured singly below for more detail). I used a Signo Gel Pen to lightly color in my sails. The paper is the new Nautical Expedition DSP that is in this catalog as well (also available as a download with MDS). If I could have found the new Baker's Twine that I ordered a few weeks back, I might have used that as my embellishment, but ... I settled for a doubled-up linen thread instead. I'll probably find that twine as soon as I post this! LOL! I decided to use one of my Build-a-Brads embellishments on this card too -- I punched out a small ship wheel from an extra piece of the Cherry Cobbler DSP from the Nautical Expedition paper pack and adhered that to the Build-a-brad. I love this little detail! The Night of Navy layer is embossed using the Big Shot and the Square Lattice folder too. The green card on the right (and pictured below) also features a stamp set from the mini. It's called "Best Dad Ever" and I love the options with this. It has sentiments that could be stamped, but I opted to use a sentiment from the "Full of Life" stamp set instead -- the credit for that goes to another demonstrator who pictured a similar card in different colors on Stampin' Connection, the demonstrator website that is chock-full of ideas to share and expound upon!! My colors are Chocolate Chip and Wild Wasabi, with a strip of paper from the Woodland Walk DSP that I believe is retiring at the end of this stamping year. I was stuck on this next card (pictured below) a bit. I stamped and colored my tree with the blender pen and my Wild Wasabi/Soft Suede ink, and then couldn't decide on a sketch to use. The image almost took up too much of my standard-sized, 4 1/4" x 5 1/2" card, so I finally decided to mount it on a larger So Saffron card base. The measurements for this one is 9 1/4" x 6 1/4", scored at 4 5/8". I then added another mat using a second piece of paper from the Woodland Walk DSP. The wide chocolate chip stitched ribbon was a good finishing touch, since I couldn't decide on a sentiment for the outside of the card. 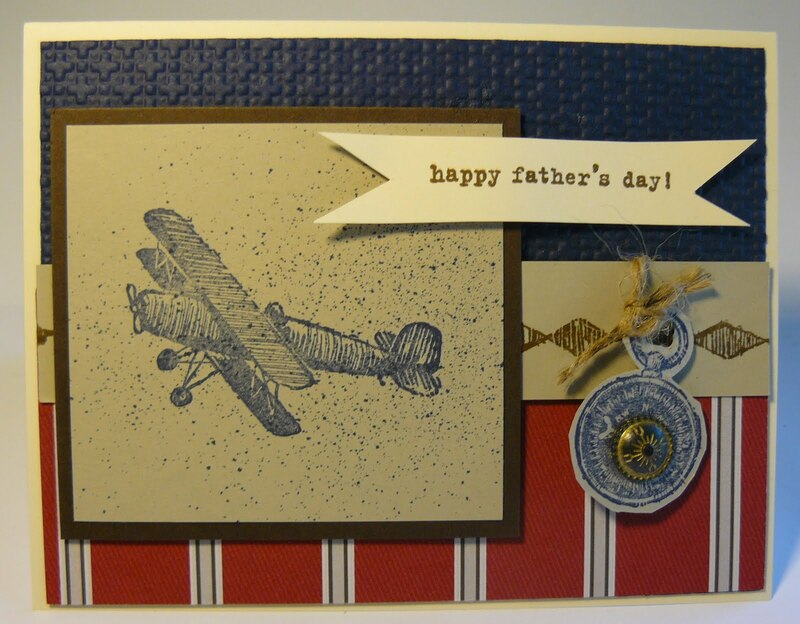 This way my customers can choose the occasion for the card if they opt not to use it for Father's Day this weekend. 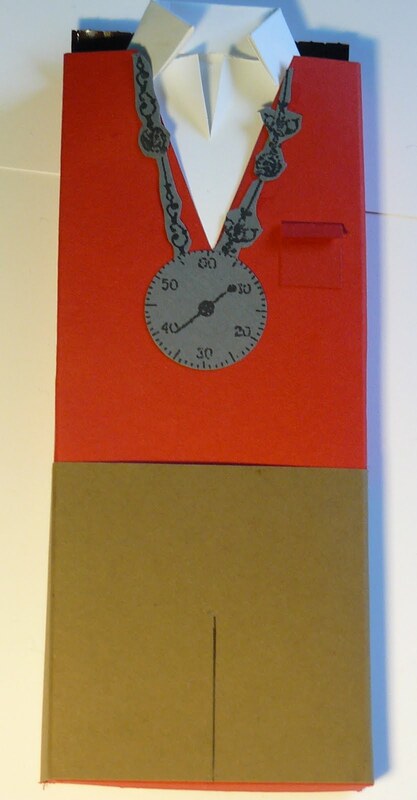 The last card used a template and instructions from Jackie Topa. 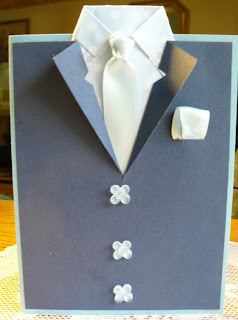 It's a fun shirt card and wasn't that difficult to make! 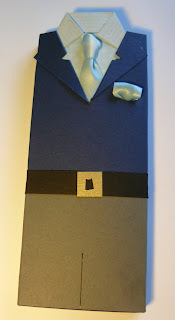 I love navy suits, so I made my card Bashful Blue and Night of Navy -- the DSP is retired but still left over in my stash. Since I'm also a sucker for polka dots and/or stripes, my "shirt" is a Bashful Blue DSP. 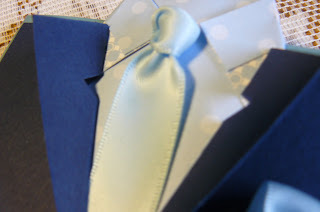 I used some Bashful Blue Satin Ribbon (I can't remember ... is that retiring?!) for the "handkerchief" and the "tie". All I can say is that it's a good thing that I'm not a guy, 'cause I can't tie a tie for nothin'!! I think tie-tying might be a gift! Now that I think about it, not all guys can tie one either! LOL! This tie, however, was extremely easy following Jackie Topa's directions! Here are two more views below. I "made" my buttons using the mini punches and some Marina Mist card stock below the clear mini buttons. My entire card, by the way, is on a Marina Mist base. If you live in northeastern Massachusetts or Southern New Hampshire, by all means, come to the class tonight! The cost is $12 for 3 cards, with the optional shirt card and additional $3. The time is 7 pm tonight, and I don't think the cards will take that long to make. You can go to my website and click on the event you'd like to attend to follow the steps to RSVP. Last Week's Quilt Cards Class! I finished my Quilt Card class last week and just want to post some photos very quickly. The class was a big hit, and a learning experience for all! Besides the cards I made, I also taught everyone how to make a fabric flower. Unfortunately, I was waiting for my fabric to arrive from Stampin' Up, so I ended up going to a LCS to buy a fabric bundle. Enjoy my photos! The cards and fabric flower we made. The card is a Very Vanilla Base, Pink Pirouette mat, and a collection of the Springtime Vintage DSP -- the squares are 1 1/4" and applied to a base, then cut out with the top note and finally embossed (using the Finial Press embossing folder and the Big Shot) before being adhered to the card base. 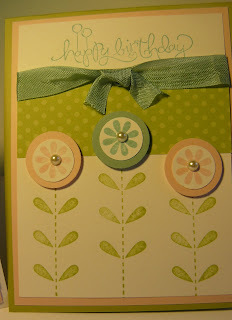 I used the Roses that were in the spring mini as well as some Certainly Celery seam binding to embellish my card. This card was totally inspired by my downline, Laura, who shared it at a demonstrator shoebox swap this spring. The squares are 3/4" and adhered to a cardstock scrap, then embossed with the Vintage Wallpaper embossing folder and the Big Shot. 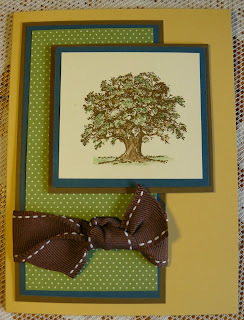 I still have a few kits left if you live in the area and want to make this card!